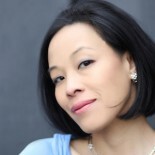 On Christine Toy Johnson’s night off from playing “Bloody Mary” in the Guthrie Theater’s production of SOUTH PACIFIC, she’ll be helming a reading of PAPER SON, which she authored, on Monday, August 8 at 7 pm in the Guthrie’s Kitchak Lounge. The Guthrie Theater is located at 818 S 2nd St, Minneapolis, MN. The cast features several of her SOUTH PACIFIC cast mates Erin Mackey (“Nellie Forbush”) and Katie Bradley (“Bloody Mary’s Assistant), along with Randy Reyes (artistic director of Mu Performing Arts) and Eric “Pogi” Sumangil. A conversation with Erika Lee, Professor of American History, Director of the Immigration History Research Center at the University of Minnesota and award-winning author of THE MAKING OF ASIAN AMERICA, will follow the reading. This is the first time that Johnson and Lee, who are first cousins, are collaborating on an event together, which is Standing Room Only. PAPER SON is about a young Chinese man who tries to balance his American identity with his family’s immigrant journey. It’s 1952, and when he meets his match in an American-born-Chinese girl, romance and new questions about the name he lost in his secretly illegal immigration follow. Inspired by the playwright’s father’s own story. Lt. Cable (CJ Eldred), Bloody Mary (Christine Toy Johnson) and Liat (Manna Nichols). Photo by T. Charles Erickson. CHRISTINE TOY JOHNSON is an award-winning writer, actor, director and advocate for inclusion. Her plays and musicals have been developed and produced at such places as the Roundabout Theatre Company, Village Theatre, Crossroads Theatre, The Barrow Group, Prospect Theater Company, CAP21, The Weston Playhouse, Gorilla Rep, and Leviathan Lab. A collection of her written work is included in the Library of Congress Asian Pacific American Performing Arts Collection. Proud member: Dramatists Guild Council, Actors’ Equity Association Council, Asian American Composers & Lyricists Project (Founder), BMI (alum). She was honored by the JACL (the nation’s largest and oldest Asian American civil rights organization) in 2010 for “exemplary leadership and dedication”, the “Wai Look Award for Service in the Arts” from the Asian American Arts Alliance in 2012, and the Rosetta LeNoire Award for “outstanding contributions to the universality of the human spirit” from Actors’ Equity Association, in 2013. www.christinetoyjohnson.com. ERIKA LEE teaches American history at the University of Minnesota, where she also directs the Immigration History Research Center. The granddaughter of Chinese immigrants, her award-winning books include At America’s Gates: Chinese Immigration during the Exclusion Era, 1882-1943 and Angel Island: Immigrant Gateway to America (co-authored with Judy Yung). Lee’s new book, The Making of Asian America: A History (September, 2015), a new history of the fastest-growing group in the United States timed to commemorate the 50th anniversary of the 1965 Immigration Act, has already received starred reviews from Library Journal and Kirkus Review, which calls it “a powerful, timely story told with method and dignity.” Erika has been the recipient of numerous national awards, including best book awards from the San Francisco Chronicle, the Immigration and Ethnic History Society, the Association for Asian American Studies, the American Librarians Association, and the Western Historical Association. In 2015, she received the Immigrant Heritage Award from the Angel Island Immigration Station Foundation. This entry was posted on July 12, 2016 by Lia Chang in Asian American Artists, Asian American Issues, Chinese American History, Entertainment, Theater and tagged Backstage Pass with Lia Chang, Christine Toy Johnson, Eric “Pogi” Sumangil, Erika Lee, Erin Mackey, Guthrie’s Kitchak Lounge, Immigration History Research Center at the University of Minnesota, Katie Bradley, Lia Chang, Mu Performing Arts, Paper Son, Professor of American History, Randy Reyes, South Pacific, THE MAKING OF ASIAN AMERICA.